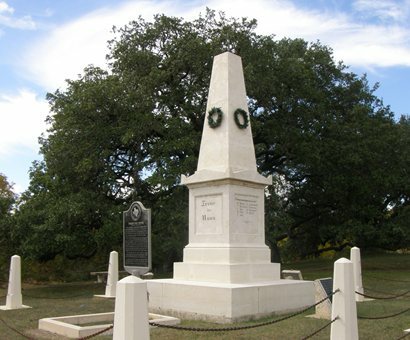 Treue Der Union, Loyalty to the Union, monument in Comfort Texas. Near the High School. High Street between 3rd and 4th. This memorial is for German settlers who were established here, but were killed on their way to Mexico during the Civil War. They were attacked by Confederate forces near Brackettville on August 10, 1862. The bodies were not buried and the bones were retrieved and placed here in 1865. The monument was erected in 1866. The incident shares several similarities to the Bandera Tragedy Tree incident. This German language monument, erected 1866, honors the memory of 68 men (mostly Germans) from this region who were loyal to the Union during the Civil War. Trying desperately to reach U.S. Federal troops by way of Mexico, about 40 of the men were killed by vengeful Confederates bent on annihilating them, in the Battle of the Nueces (on Aug. 10, 1862) and a later fight (Oct. 18). The bodies of the slain and those who drowned swimming the Rio Grande were left unburied. A group of Germans gathered the bones of their friends and buried them at this site in 1865. 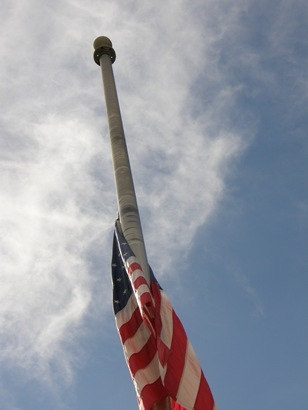 It is said that only this monument and Arlington National Cemetery are permitted to fly the American flag at half staff the year round.